The idea of working from home is attractive to a lot of people. There are many stories shared on social media about people who have given up their nine to five jobs and have managed to run a successful business from the comfort of their own home. The idea may seem attractive but it is not always that easy to pull off. 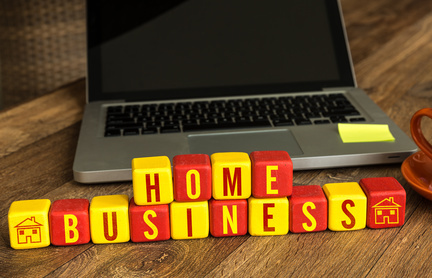 In this article I will give you some advice on what it takes to make a home based business work. If you want to work from home you need to be able to separate your home life from your work life. This might seem easy to do but in reality it can be difficult. When you go to work in an office you don’t think about the daily household chores at home like washing, cleaning or ironing or the fact that the house may be untidy, no, you are normally focused on the job you are doing. When you are working from home all of these tasks are “in your face” and it can be very easy to fall into a trap where you are doing more household work, than your home business work. It is therefore very important to be disciplined. So it is important to set your own hours, for example you could work from nine in the morning, until three in the afternoon. Make sure you have an office where you would only leave if you really needed to, maybe for refreshments and meals. Remove distractions like Televisions, if you’re anything like me you’d be too tempted to watch Television all day. To succeed at working from home you need to have a great deal of self confidence in your own ability. There are likely to be “ups and downs” some months you are excelling but in others everything seems to go wrong. Having the confidence in your own ability is essential in helping you to get through the rough times. Get into the habit of saving money from the times that your business is excelling to cover you when your business is slow. Working from home can be tough and lonely, so you need to be able to stay motivated. There is no boss to make you work or other people to share ideas with. Some people find that working from home can be too lonely and soon return to an employed environment where they are able to have greater contact with other people. It is important to remember all of the benefits of working from home when we have a drop in business or when we feel a bit lonely. For me, there is nothing better than being self-employed and working from home. There are many other people that could also work from home and make it work as long as they have the right attitude. If you enjoyed this article “Working from home needs the right attitude” please feel free to share socially or leave a comment below. As an introvert, I am realizing more and more that I would rather have an at-home job. Those darn distractions though! That is definitely something I am currently struggling with: figuring out how to actually stick to a consistent schedule and to be productive. Luckily I have two friends in particular who are encouraging me to fulfill this dream. If you find anybody like that, hold on to them! There are so many businesses that have fallen by the wayside because people just didn’t work them. You do need money and some time, but attitude is everything! I totally agree you need to be committed or the distractions will affect your success level. Most people fail because they give up too soon. Making money online is hard work and I encourage everyone to keep going, you’ll reap the benefits in no time. Thank you for your comments. This is great advice. I find myself on youtube or messing around on the computer a lot of the time when I know I am supposed to be doing work.I hope that this article will help me become more disciplined. I love the title – biggest problems are being disciplined (too many trips to the coffee maker) and too many distrctions (kids fighting all the time). You are correct – the right attitude is needed so much! Hi Ryan, Yes, I agree you have to be disciplined, even when you don’t see instant results, you must be patient. It takes, hard work and effort to succeed at anything and building an online business is the same. Thank you for your comments :).